We are Serving San Francisco, South San Francisco, and Neighboring Areas. Are you facing efficiency issues with your gas appliances or have noticed a sudden increase in gas bills? If yes, you probably need to consider gas pipeline inspection and repair services. 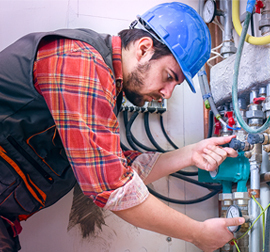 Citywide Plumbing offers gas pipeline installation, repair and maintenance services in San Francisco and neighboring areas. We are highly rated on Yelp and have a team of licensed, insured and bonded plumbers. We offer upfront pricing, quality workmanship, and professional services. A gas line is an essential component of your home that powers water heater, fireplace, stove, and other appliances in and around the house that help to keep your home dry, warm, and comfortable. You probably need gas pipeline repair and maintenance services when these pipelines start aging and corroding. Avoiding gas leaks is as simple as scheduling regular gas pipeline checks and making sure appropriate installation of natural gas pipelines by certified professionals. When it comes to fixing gas pipeline leaks, it is vital to ensure everything is in perfect working order for both efficiency and safety reasons. Citywide Plumbing is a reliable plumbing contractor in San Francisco to get gas leak detection services. Our qualified experts work abreast with the right authorities to get rid of hazardous circumstances. In order to solve your gas leak crisis, we swiftly discover the leak and repair it working with the gas companies to reinstate the service back again. So, if you are also planning to install a new gas pipeline or any gas appliance or need help to maintain the existing ones, feel free to call Citywide Plumbing at (415) 716-1519 or (650) 993-8159 today and get exceptional customer service. We offer quality services throughout South San Francisco, San Francisco, San Bruno, Millbrae, Daly City, Colma, Burlingame, Broadmoor, and Brisbane. Citywide Plumbing is a licensed plumbing company that has been serving its customers in San Francisco and its neighboring areas. Our solutions are backed with quality workmanship. Copyright © Citywide Plumbing 2018. All rights reserved.